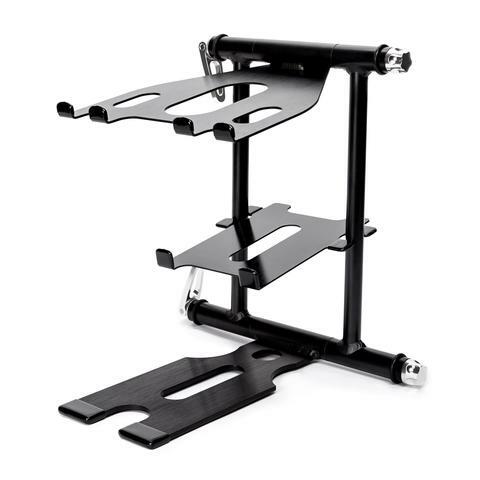 Does anyone have any recommendations for laptop stands that can fit a Mixer, Audio Interface and Laptop? This is to be placed next to my Roland Vdrums. Hopefully one that has 3 different levels so it doesn't get too messy and one that is sturdy enough that I can edit tracks from so I don't need to move my laptop elsewhere to begin editing. I would like to have options. There's always going to be a compromise between sturdy and portable. If you have the space at home, a table would suffice as it give you room for stuff and the ability to drive a mouse (a lot of laptop stands don't offer that space). On the table you could put a DJ Laptop stand like the Crane, above.. (I use one when DJing, with room for the laptop on the stand and a controller / mixer under it.). Other things you could look at are projector stands. Often these have at least two shelves (projector / laptop) and are quite sturdy (and often pricey!). I've searched for years for such a stand and only ever found stands that could accommodate 2 of the 3 - and the audio interface was usually the component that was left on the floor or round the back somewhere. Gibraltar make some supports in their specialist stands but quite heavy and convoluted to adjust in my experience. I've got this one with 3 tiers - however the centre tier just sits in place held by friction and is all but useless although I'd hoped to put the audio interface on it. 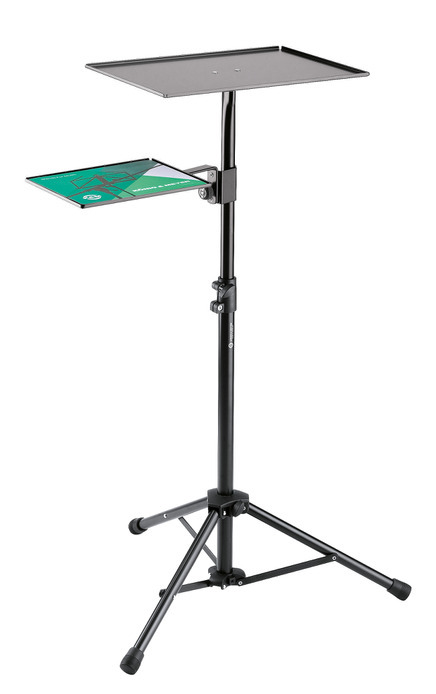 Expensive but quick to put up and very light to carry - also needs something to bring it up to working height next to you (I sit it on the sub unit of my drum PA next to me). I've tried Koenig & Meyer's laptop stand but it is only really happy with just a laptop on it, although it is good for that. If you do find something that suits do let us know. "Editing"? So it'l just be used at home - not live? Or do you need something that can be collapsed for live use?